Using a Bootstrap template is the quickest way to create a Bootstrap website. 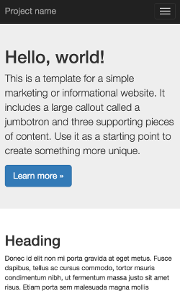 The Bootstrap website has a number of templates available that you can use as a basis for your projects. Simply download the template, customize as required. 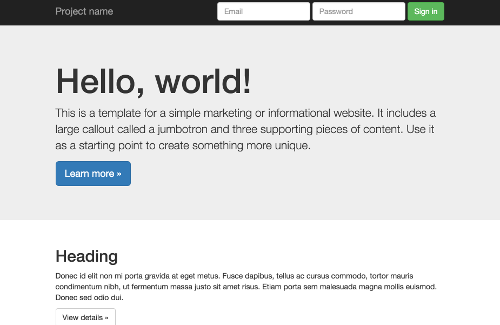 Below is an example of a Bootstrap template. I loaded this template then resized my browser to approximate different device sizes. You can see that the layout automatically responds as I resize my browser. You can find Bootstrap amongst the templates here at Quackit. Here are some examples. Bootstrap has also released a theme website, where you can purchase and download themes with a license that allows for unlimited use for you and your clients. Also includes free updates for the life of the theme.